It was a bit early in the year to be this warm, but we were taking advantage of it. My work team and I headed to the patio for lunch. Sitting in the late-April sun, the topic turned—as it often does in Vancouver—to environmentalism. 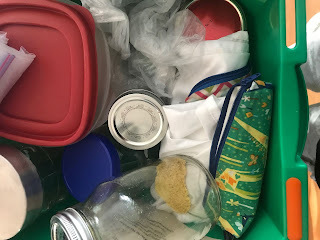 I mentioned that in my house, we were about to launch into a plastic-free challenge for the month of May. “It’s hard to do—so hard,” exclaimed one of my team members. But not just any team member. My weekend-warrior-cleaning-up-the-shoreline-save-our-parks-pipeline-protesting team member. If they, with all their environmentally aware activity, was saying that, what chance was I going to have with my consumerist family of four? None the less, we don’t shy away from a challenge that easily. As a family, we’ve done a few things in past to try and break ourselves from our normal routines. We did a 100-mile diet challenge a ways back. 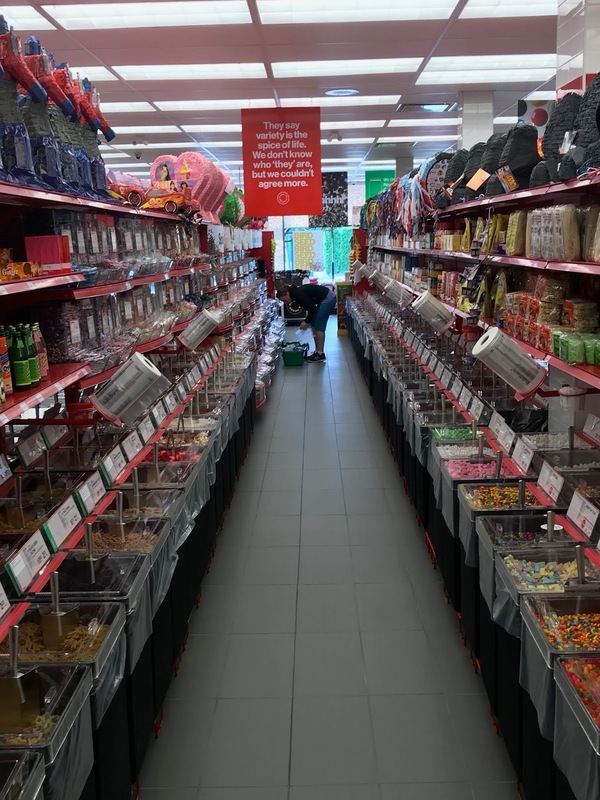 It forever changed the way we approached what food we bought. We more recently did a veganism challenge, too, and I, for one, completely broke any need or want for eating beef. As a family we 've reduced ourselves to having chicken or turkey meat once a week, and we've drastically cut the amount of cheese we eat (eggs are back on the menu, FYI). Our cupboards are full of glass now. A plastic-free challenge. What was it going to look like? What rules were we going to play by? It was both unrealistic and holier-than-though to say we were instantaneously going to cease use of any and every plastic product. That would mean turfing everything from our fleece jackets to the extra plastic bags we have in our kitchen drawer. We would generate more waste than we’d save playing by that rule. SO what were our rules? Back to basics with the plastic we encountered: Reduce, Reuse, Recycle. No new plastic, with exception of the lids that come into our house as caps on our son’s almond milk (dairy intolerance!). If you didn’t bring something to put it in, you can’t buy it. Those three simple rules pretty much dictated all of our purchasing of food and goods in the month of May. If we were going to a grocery store, we’d need to bring our own containers and/or bags. 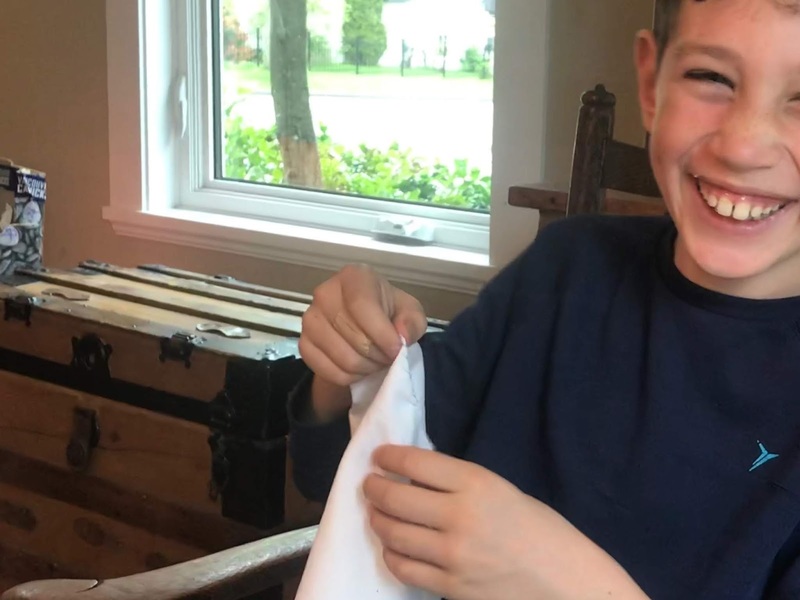 As a family, we had a sewing session where we cut up an old sheet and turned it into a pile of cloth bags to take to the store for produce. The kids had fun with it, and learned a new skill at the same time. Win-win! We started buying more in bulk, using containers or Ziploc/plastic bags already in our possession in which to put the bulk items. 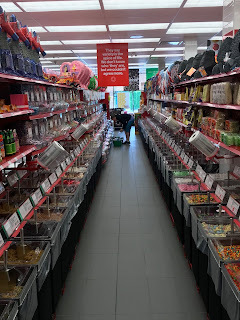 Places like Bulk Barn and Super Store are like aisles of bulk food heaven! Our greatest challenge seemed to be getting cheese. You can either go to a place in Vancouver called the Soap Dispensary (Main st. & 21st Ave-ish) and pay an absolute fortune for a hunk of cheese that is food enough for one, but not four people, or you can go to the deli counter of your local store and ask if they will cut a hunk of cheese for you. We had a few wins and a few losses in this column. A couple of places would take our container, tare the weight of the container, then disappear into the back to cut a hunk of cheddar off a big block for us. Other times, they would stare at us blankly. “No, you can’t do that”. One other time, when I didn’t have a container, I asked if the clerk could just wrap it in deli paper. She said “Sure! Happily!”. She came out from the back with a block of cheese wrapped in a thin plastic sheet of “paper”, sealed in a Ziploc bag. “There you go!” she said merrily as she handed it to me. Eh? Is the dependence on plastic to the point where deli counters now refer to the little plastic sheets they use to drop the meat onto as ‘paper’? When it comes to produce, we're now fully committed to something we knew all along: it is so easy to gather without a single-use plastic bag, and we’re never going back. Half of it really doesn’t need a bag at all, of course. A stalk of celery holds its own ribs in place. Zucchini and cucumber can easily go without bags. Mushrooms can be put in paper bags. Tomatoes can be bought on a vine, and the list goes on. It’s only for our own basic convenience that we ever put them in bags at all, right? 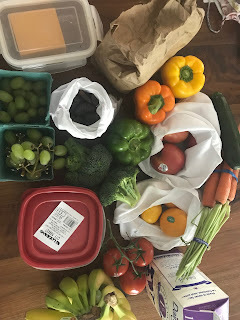 As for cloth bags, no, you can’t see the produce inside, but they refrigerate just fine, and they are easily thrown in the wash.
We did miss out on some things we like. The kids go through grapes like locusts on a summer crop field, and we largely cut those off the shopping list since they almost always come in plastic bags, unless we could find them in paperboard punnets (which we did a couple of times). We all love tofu in our house, and we use it regularly. Happily, we were able to find this one at the Soap Dispensary, and unlike the cheese, it’s dirt cheap to buy in blocks. So we have a glass container in our fridge now that houses our tofu. Squeezing homemade nutmilk through a cheesecloth. Good for hand strength training, with tasty results. Any meat that we did buy, we either got sliced into a container that we brought to a deli counter (lunch meat for sandwiches), or we went to a butcher (a little pricier, but local, and they wrap it in paper or seem happy to put it right into our provided containers). If we were out and about and wanted a cup of coffee, our rule was: didn’t bring a travel mug? Don’t buy the coffee, unless you don’t get a lid (but we’re even feeling guilty about single-use paper cups now, so we just stopped buying coffees to-go altogether unless we had our mugs!). Also asking for no straws on the few occasions we went to restaurants was a new habit that we fully intend to keep going on (good timing, since Vancouver intends to ban single-use plastic straws). 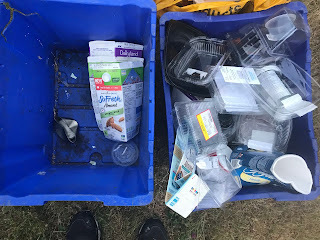 Outside of the grocery shopping, we also tried to keep any other new plastic from coming into the house, so we cut down on the number of material goods this past month as well. All in all, it has been a good experiment, and in many—if not most—areas, we will continue our newly adopted habits. Kate said she felt weird when a piece of cheese came into the house with plastic. Me too. The kids as well (our daughter refused to eat cheese strings that were in the fridge, for the whole month, because they had plastic around them), seem on board with the plan. There are other positive spin-off effects where we were trying to cut out the plastic, but still wanted a product normally swaddled in a bag. SO much bread in the store is wrapped in plastic. But making a loaf at home takes almost no effort and only costs a few cents to produce a loaf. So guess what? Homemade bread, all day every day. It’s FREAKIN’ DELICIOUS. 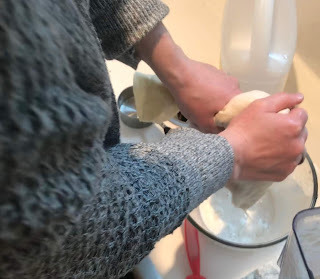 We also tried making homemade Almond milk, which has a very simple recipe of: Nuts +water + cheesecloth + blender = expensive, but delicious, and plastic-free. HI! I'm homemade bread! I'm cheap, fast, and tasty. Click this caption for a no-knead bread recipe! The biggest impact became obvious in our trash can and recycling bin. We only needed to take out the garbage every few weeks, and even then, almost none of it was plastic. Our recycling “blue box” is almost empty now when I take it to the curb each week. Listen, I get it. This is the impact of one family of four. And it’s predicted that by 2050, if things don’t change on a much larger scale, then there will be more plastic in our oceans than there are fish. Nevermind the fact that we’re already reaping what we sow anyway, with microplastics hiding in our water and food supplies and we’re eating it all the time. Just Google ‘how much microplastic do we consume’, and be horrified at how much potentially goes into your system every day. So how much impact will the change in our one household make? Almost none. We already drive a hybrid, bike most places (including to get all the groceries in these pictures! ), hang out the laundry instead of using a dryer, etc. And we're glad we are able to do these things, but we know there's more we can do, and without others doing it too, not much is going to change. take containers with you for every trip! Will you make some changes yourself, then, and join in? Because, as it turns out, it’s not actually all that hard. June 8th is World Oceans Day. and the focus of this year's event is plastic pollution. Read more about what you can do to help! Lots of food. hardly any plastic.